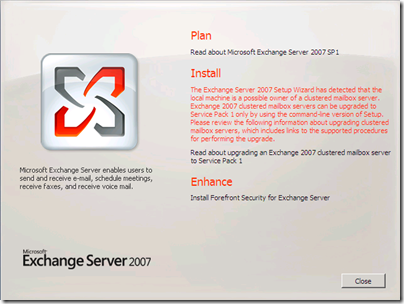 Welcome to the third part of Upgrading Exchange Server 2007 to Service Pack 1 (SP1). In previous parts we looked into necessary procedures for preparing Active Directory and upgrading HUB/CAS roles (or single Exchange Server with HUB, CAS and Mailbox role installed) to Service Pack 1. 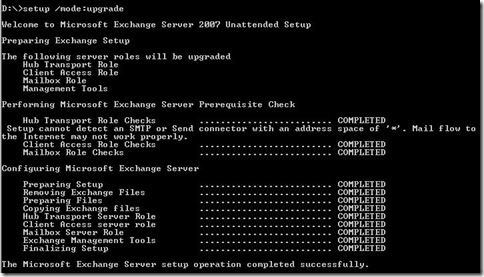 In this part we will go trough necessary steps for successful upgrade of Exchange 2007 Single Copy Cluster to Service Pack 1. Prior installing SP1 read carefully section with prerequisites (install necessary components and updates on Windows Server, upgrade antivirus software for Exchange Server) from my previous post Upgrading Exchange 2007 to SP1 (Part 1)! Upgrading Single Copy Cluster (SCC) to SP1 is different from upgrading non-clustered Mailbox Role to SP1 in many ways. Notice that in Part 1 and Part 2 we were using both GUI and unattended mode but only option for cluster upgrade is using unattended mode. What are the minimal permissions you need for successful upgrade? Exchange Server Administrator membership and Local Administrator on servers is required. For the demo purposes we will use only two-node cluster setup. 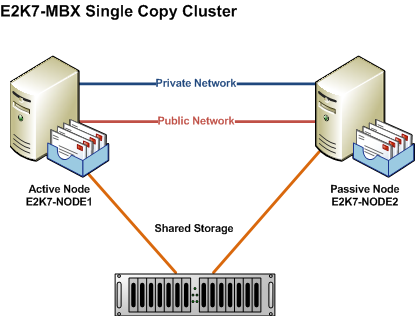 Active node named E2K7-NODE1, passive node named E2K7-NODE2 and exchange cluster named E2K7-MBX. 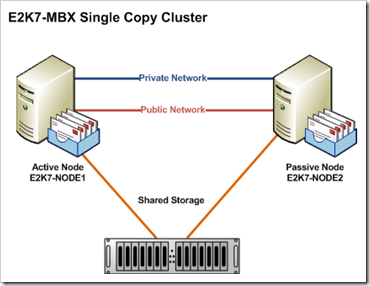 Move all Cluster Groups to active node (E2K7-NODE1). Set Windows Firewall/Internet Connection Sharing (ICS) service to Manual or Automatic and start it. This service is disabled by default. During upgrade procedure this allows setup to add firewall exceptions for Exchange Server services. You can stop and disable this service after upgrade! It also works if you leave Windows Firewall/Internet Connection Sharing disabled but no firewall exceptions for Exchange Server services are created during setup. I recommend that you start Windows Firewall/ICS service during setup and than stop/disable it if you are not using Windows Firewall service! Stop any services that have open handles to performance counters (for example: Performance Logs and Alerts, MOM agents,...) - performance counters are changed during upgrade procedure. Stop, and then restart the Remote Registry service. From command prompt run setup.com /m:upgrade from folder with SP1 setup files. After successful upgrade reboot Passive Node (E2K7-NODE2). Log on to server after reboot and open Exchange Management Shell. 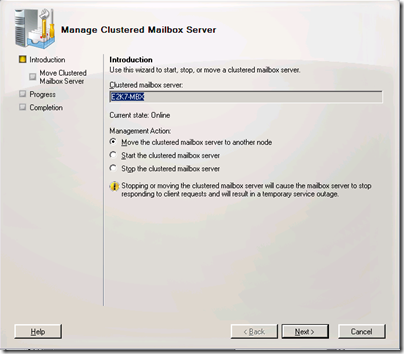 Use the Stop-ClusteredMailboxServer cmdlet to stop the clustered mailbox server. Stop-ClusteredMailboxServer E2K7-MBX -StopReason "SP1 Upgrade." 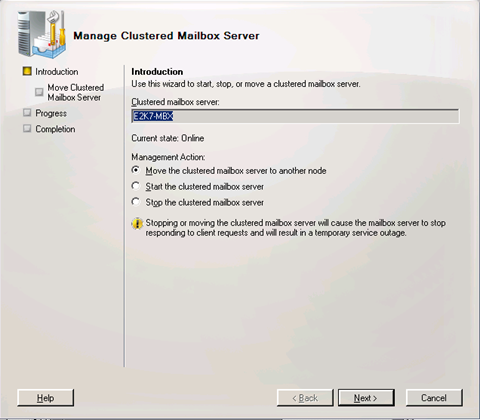 Use Move-ClusteredMailboxServer cmdlet to move the clustered mailbox server (CMS) from Active Node (E2K7-NODE1) to Passive Node (E2K7-NODE2). You must run this from Passive Node (E2K7-NODE2). Move-ClusteredMailboxServer E2K7-MBX -TargetMachine E2K7-NODE2 -MoveComment "SP1 Upgrade." From command prompt run setup.com /upgradecms from folder with SP1 setup files. Reboot node after successful upgrade. You can disable Windows Firewall/Internet Connection Sharing (ICS) now. Congratulations, your Single Copy Cluster is now upgraded to Service Pack 1. During upgrade procedure we changed ownership of Cluster Groups. If you would like to move groups back to previous owner you can use previous mentioned steps or you can use one of new features in Exchange Server 2007 Service Pack 1 called Manage Clustered Mailbox Server wizard for desired actions. This is one "simple" error I come across when installing on Windows Server 2008 RC1. 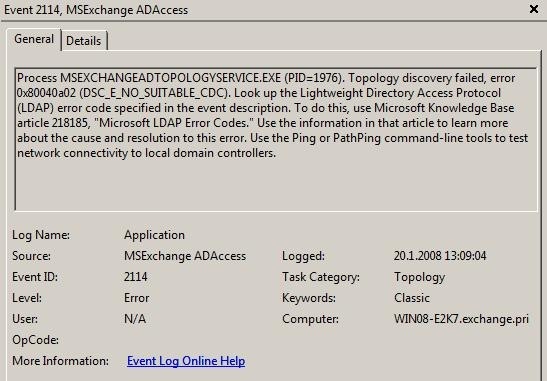 Process MSEXCHANGEADTOPOLOGYSERVICE.EXE (PID=1976). Topology discovery failed, error 0x80040a02 (DSC_E_NO_SUITABLE_CDC). Look up the Lightweight Directory Access Protocol (LDAP) error code specified in the event description. To do this, use Microsoft Knowledge Base article 218185, "Microsoft LDAP Error Codes." Use the information in that article to learn more about the cause and resolution to this error. Use the Ping or PathPing command-line tools to test network connectivity to local domain controllers. 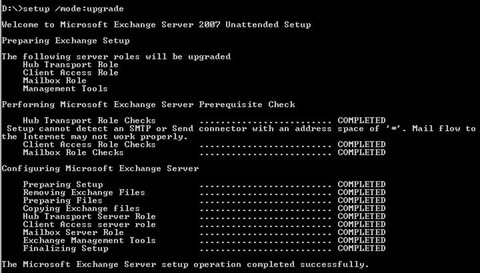 This is second part of upgrading procedure for Exchange Server 2007 SP1. In first part we looked into necessary steps for getting Windows ready, preparing Active Directory and upgrading Client Access Server (CAS) role to Exchange Server 2007 SP1. In this part we will look into upgrading HUB Transport Server role to SP1. Procedure is almost identical than in first part (upgrading CAS to SP1) but purpose of this part is looking into Unattended Setup. Procedure is the same as in graphical mode. First step is is Prerequisite check. Note that I cheated just a little bit. ;-) I had other roles on this server, not just HUB role. When running setup /mode:upgrade you receive the list of roles that will be upgraded. You can use this steps (and steps for preparing Active Directory) for upgrading single server installation. If no critical errors were found setup continue with Configuring steps (Preparing Setup, Removing Exchange Files, Preparing Files,...). In Unattended Mode you also have a progress bar just like in graphical mode. And a final screen after successful Service Pack 1 installation. 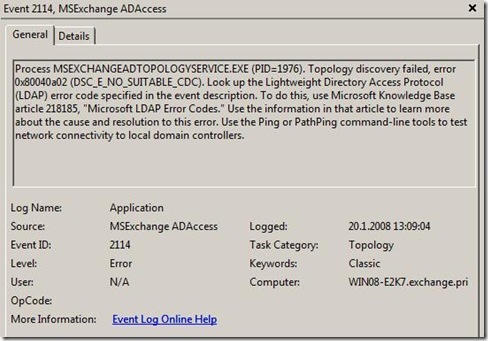 Check Event Viewer and Exchange functionality to verify that everything is working as expected. In following articles we will dive into cluster (Single Copy Cluster - SCC, Cluster Continuous Replication - CCR) upgrading and some new high availability features in SP1. We just got the scoop from Microsoft on Windows Mobile 7 and Windows Mobile 8, the two upcoming platforms that will fix what is undeniably broken about the Windows Mobile platform to date. Microsoft Information Technology (Microsoft IT) maintains a complex Microsoft® Exchange Server environment consisting of several geographic locations and multiple Active Directory® forests. There are 16 data centers, four of which host Exchange Mailbox servers, to support more than 515 office locations in 102 countries with 121,000 users, including managers, employees, contractors, business partners, and vendors. 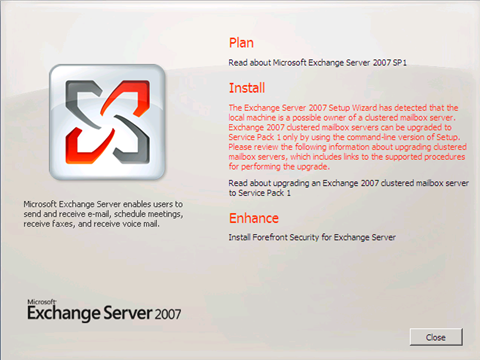 Site and server consolidation conducted with Microsoft Exchange Server 2003 and new deployment features available in Microsoft Exchange Server 2007 in combination with proven planning, design, and deployment methodologies enabled Microsoft IT to transition this environment to Exchange Server 2007 in less than eight months. Microsoft IT decommissioned the last Mailbox servers running Exchange Server 2003 in the corporate Active Directory forest shortly after Microsoft released the new Exchange Server release to manufacturing (RTM) version on December 7, 2006. This technical white paper discusses the Exchange Server 2007 architectures, designs, and technologies that Microsoft IT chose for the corporate environment and the strategies, procedures, successes, and practical experiences that Microsoft IT gained during the planning and design phase. In addition to common planning and design tasks typical for many Exchange Server deployment projects, such as server design, high-availability implementation, and capacity planning, transitioning a complex messaging environment to run on Exchange Server 2007 also entails specific planning considerations regarding directory integration, routing topology, Internet connectivity, client access technologies, and unified messaging (UM). This white paper is for business decision makers, technical decision makers, and operations managers. It assumes that the reader has a working knowledge of Microsoft Windows Server® 2003, Active Directory, Exchange Server 2007, and Microsoft Operations Manager. Because many of the principles and procedures discussed in this paper are based on standard operations methodologies, a high-level understanding of the MOF, MSF, and ITIL models is also helpful. This technical white paper discusses the deployment checklists that the Exchange Messaging team created based on the Exchange Server 2007 architecture and design specifications for the corporate production environment. The first two sections briefly reiterate the reasons why the Exchange Messaging team uses checklists, and the sections explain the Microsoft IT server life-cycle management process. These sections also discuss the usefulness of checklists from a decision maker's point of view and highlight the responsibilities of the Exchange Messaging team within the overall Microsoft IT organization. The third section, "Pre-Installation Deployment Checklists," covers the tasks the Exchange Messaging team performs to prepare servers for later installation of a specific server role. In some cases, a server role requires additional configuration. These tasks are role-specific and are listed in checklist form. The next sections provide detailed discussions of the various checklists that the Exchange Messaging team created for the individual server roles. This technical white paper also includes an appendix titled "Deployment Worksheets," which contains a set of worksheet templates that are derived from the Exchange Messaging team checklists. These worksheet templates can serve as a starting point to create custom checklists based on the specific needs of an IT organization. Microsoft announced Windows Essential Business Server (previously code-named "Centro"), a new integrated multiserver solution designed for midsize businesses with sophisticated IT needs which offers integrated security, simple administration with unified management console and just like in Small Business edition integrated multiple products which are normally cheaper than if you buy separate licenses. In Premium Edition you will also get Microsoft SQL Server 2008 Standard Edition. If I`m honest I never liked idea of Small Business Server. Why? On one side you have best practices which says that you should not put for example Domain Controller and Exchange Server on one box. On the other side you have product which have everything together. On one or on two servers. So I have the same opinion about Windows Essential Business Server. I sure hope that you will be able to install it to separate servers. But it also has good side. It cost less than separate products so it`s great for small companies with low budget for IT. Microsoft Office Communicator Mobile (2007 Release) extends the reach of Office Communications Server 2007 to information workers who use Windows Mobile powered devices. Communicator Mobile provides presence and communication features that are similar to the desktop version of Microsoft Office Communicator 2007 when users are away from their desks. The Microsoft Office Communications Server 2007 Best Practices Analyzer is designed for administrators who want to determine the overall health of their Office Communications Server 2007 servers and topology. The Microsoft Office Communications Server 2007 Best Practices Analyzer Tool is a diagnostic tool that gathers configuration information from a Microsoft Office Communications Server 2007 environment and determines whether the configuration is set according to Microsoft best practices. You can install the tool on a client computer that runs Microsoft .NET Framework 2.0, or on a server that runs Office Communications Server 2007. Note: Although you can install the Office Communications Server 2007 Best Practices Analyzer directly on the computer that runs Office Communications Server 2007 Server, we recommend that you install and run this tool on a client computer. The tool uses set of configuration files to gather information from the Office Communications Server 2007 environment. It compares this data against a set of pre-defined rules for Office Communications Server 2007, and reports potential issues. For every issue reported, the tool provides the current configuration in the Office Communications Server 2007 environment, and the recommended configuration. This documentation package contains all Office Communications Server 2007, Office Communicator 2007 and Live Meeting 2007 client for Office Communications Server documentation.